3rd Flight New Zealand Special Air Service (SAS) cross swampy ground in jungle training near Kuala Lumpur, Malaya, in November 1955. The New Zealand SAS was formed in 1955 with the specific intention that it would form part of the British Commonwealth Far Eastern Strategic Reserve forces in Malaya. 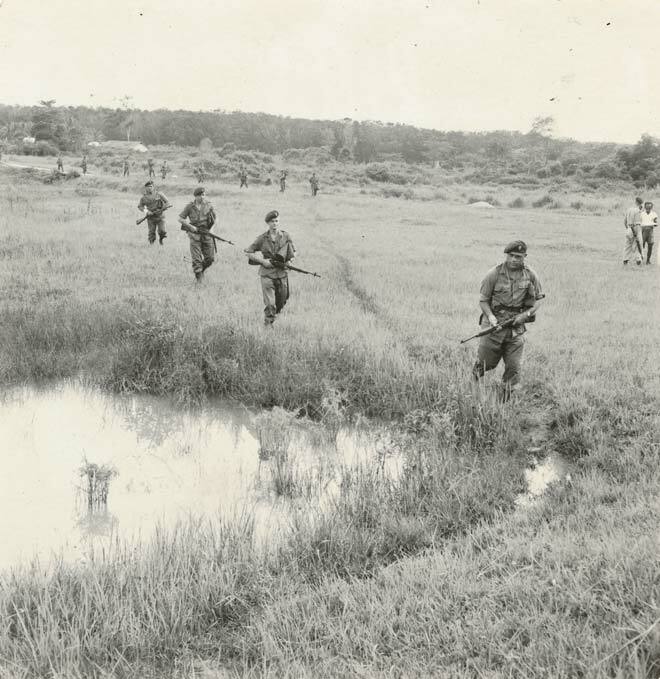 In 1956 the SAS was deployed in a series of successful operations against guerrillas in the northern states of Perak and Kelantin. The SAS moved to the mountainous eastern Malayan state of Negri Sembilan in 1957, where they carried out another successful series of anti-guerrilla actions. Sorry, we don't know who the soldier is. You could try asking the Alexander Turnbull Library, who own this photograph. It's here on their website: http://natlib.govt.nz/records/23194386. Just a query, do you know who the Maori soldier is in the front of this picture?